Our Sun's orbit has only happened 20.4 times since the Sun itself formed 4.6 billion years ago. It’s estimated that the Sun will continue fusing hydrogen for another 7 billion years. In other words, it only has another 31 orbits it can make before it runs out of fuel. In 1999 astronomers focusing on a star at the center of the Milky Way, measured precisely how long it takes the sun to complete one orbit (a galactic year) of our home galaxy: 226 million years. The last time the sun was at that exact spot of its galactic orbit, dinosaurs ruled the Earth. The Solar System is thought to have completed about 20–25 orbits during its lifetime or 0.0008 orbit since the origin of humans. When the last red embers of our Sun die out billions of years from now, we will have completed approximately 60 orbits of our home galaxy. Is there a genocidal countdown built into the motion of our solar system? Research at Cardiff University suggests that our system's orbit through the Milky Way encounters regular speedbumps – and by "speedbumps," we mean "potentially extinction-causing asteroids." Our orbit through the Milky Way is not a perfect circle or an ellipse, since the galaxy itself is a landscape of undulating concentrations of mass and complex gravitational fields. As Caleb Scharf observes in The Copernicus Complex, "none of the components of the galaxy are stationary; they, too, are orbiting and drifting in a three-dimensional ballet. The result is that our solar system, like billions of others, must inevitably encounter patches of interstellar space containing the thicker molecular gases and microscopic dust grains of nebulae. It takes tens of thousands to hundreds of thousands of years to pass through one of these regions. 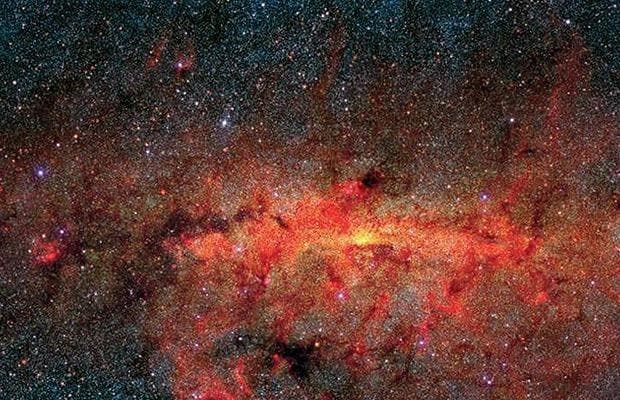 "This may happen only once every few hundred million years," Scharf adds, "but if modern human civilization had kicked off during such an episode, we would have barely seen more than the nearest stars— certainly not the rest of our galaxy or the cosmos beyond. But could our planetary circumstances have been that different and still produced us? Would more changeable orbits in a planetary system, or bad weather, or passage through interstellar clouds, also thwart the emergence of life in some way? "Phenomena such as these could be bad news, causing hostile surface environments on a planet. So it’s a possibility that the planetary requirements for forming sentient life like us will necessarily always present the senses and minds of such creatures with a specific cosmic tableau, a common window onto the universe." The visualization of the orbit of the Sun (yellow dot and white curve) below around the Galactic Center (GC) in the last galactic year. The red dots correspond to the positions of the stars studied by the European Southern Observatory in a monitoring program. If future research confirms a Milky Way galaxy-biodiversity link, it would force scientists to broaden their ideas about what can influence life on Earth. "Maybe it's not just the climate and the tectonic events on Earth," says UK paleontologist Bruce Lieberman. "Maybe we have to start thinking more about the extraterrestrial environment as well." The surge in cosmic-ray exposure could have both a direct and indirect effect on Earth's organisms, said Lieberman. The radiation could lead to higher rates of genetic mutations in organisms or interfere with their ability to repair DNA damage, potentially leading to diseases like cancer. William Napier and Janaki Wickramasinghe at Cardiff University completed computer simulations of the motion of the Sun in our outer spiral-arm location in the Milky Way that revealed a regular oscillation through the central galactic plane, where the surrounding dust clouds are the densest. The solar system is a non-trivial object, so its gravitational effects set off a far-reaching planetoid-pinball machine which often ends with comets being hurled into the intruding system. The sun is about 26,000 light-years from the center of the Milky Way Galaxy, which is about 80,000 to 120,000 light-years across (and less than 7,000 light-years thick). We are located on on one of its spiral arms, out towards the edge. It takes the sun -and our solar system- roughly 226 million years to orbit once around the Milky Way. In this orbit, we are traveling at a velocity of about 155 miles/sec (250 km/sec). Almost exactly two cycles ago, in fact. The figures show that we're very close to another danger zone, when the odds of asteroid impact on Earth go up by a factor of ten. Ten times a tiny chance might not seem like much, but when "Risk of Extinction" is on the table that single order of magnitude can look much more imposing. You have to remember that ten times a very small number is still a very small number – and Earth has been struck by thousands of asteroids without any exciting extinction events. A rock doesn't just have to hit us, it has to be large enough to survive the truly fearsome forces that cause most to burn up on re-entry. Either way, don't go letting your VISA bill run up just yet. "Very close" in astronomical terms is very, very different to "close" in homo-sapien time. The characteristic spiral arms of the Milky Way regions where stars and gas are a little closer together — waves of higher density than elsewhere in our galaxy's disc. Their additional gravity is normally too weak to alter a star's path by much, but if the star's orbital speed happens to match the speed at which the spiral arm is itself rotating, then the extra force has more time to take effect. Simulations completed by Rok Roskar of the University of Zurich, Switzerland, show that a lucky star can ride the wave for 10,000 light years or more. Our sun is an example, with some measurements implying that the sun is richer in heavy elements than the average star in our neighborhood, suggesting it was born in the busy central zone of the galaxy, where stellar winds and exploding stars enrich the cosmic brew more than in the galactic suburbs. The gravitational buffeting the solar system received then might also explain why Sedna, a large iceball in the extremities of the solar system, travels on a puzzling, enormously elongated orbit.